Zombies are still a huge trend and you can count on them being a big part of Halloween 2015. It's easy to include them in your Halloween decorations. My favorite way is with a graveyard tombstone that shows a zombie peeking out from behind it. 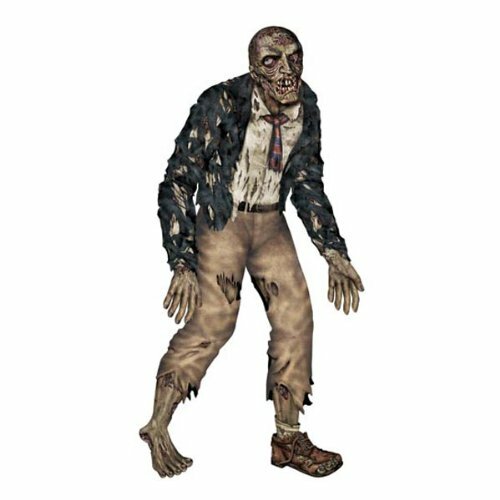 I also just love the Halloween prop that shows a zombie pushing up from under the ground. There are also realistic Zombie cardboard cut-outs that you can place in your home as well as outside. While we don't want to scare little kids and toddlers, Halloween is a great time to have some fun and scare each other. Zombie decorations and props are easy to add into your existing Halloween decorations. It gives them an edge that we can all enjoy. Attach this to your wall and have a fun Halloween version of pin the tail on the donkey. In this case, you could let people shoot a nerf ball to kill the zombie. It doesn't stand on it's own but for a $13 purchase, you can have a lot of fun with it. The Zombie hiding behind a tombstone is my favorite Halloween prop this year. I think it's the most believable. In that Zombies are prone to be found in graveyards. It's also an impressive decoration measuring 28 inches tall. The Zombie is animated so it makes a great Halloween prop for the start of your front yard walk or driveway. It's an easy Halloween decoration because it's all in one piece and takes about 10 minutes to locate. I also love the Zombie Halloween decorations that show Zombies pushing their way up through the dirt. If you already have a nice assortment of tombstone from previous Halloween decorating, then these would be perfect additions. These are also super easy to install. All you have to do is poke them in the ground. Although I like to take a little extra time and put some mounds of dirt in strategic spots to make it look more realistic. You'll also find lots of different styles of Zombies pushing up from the dirt props. So you can add different ones in front of several tombstones. This really will make it look like the Zombies are coming out to attack! Hanging Zombie Halloween props are perfect for front yard trees. They are also perfect if you have a large window facing the street. You can turn the window into a hanging Zombie scene with all sorts of fun props. Use a creepy green light to give everything a macabre vibe and you're ready to welcome guests to your Halloween Zombie party. These are also easy-to-install Halloween decorations that give you lots of visual impact. Hanging Zombie props also can scream or have eyes that light up. So you get a lot of Halloween gore for your time investment! You can hide hanging zombies anywhere. From the closet where guest will hang their coats to a corner in the kitchen where you keep your knives. Of course it's fun to have bloody knife props placed along near the Zombie. Oh and what about a hand or head on the counter next to them. A Zombie party is truly a chance to let your dark imagination shine! Brand New Novelty Warning Zombies Inside Metal Sign - Great Gift Item! Metal Tin Sign - Certified Zombie Killer - Head and Dead ! You don't have to be Anita Blake, vampire hunter and Zombie killer, to get a kick out of these signs. They'll dress up your walls on Halloween for your Zombie party. If you've got teens in the house, they'll probably love to add these signs to their bedroom decor. Zombie decor is a popular theme for kids these days. You'll find reference to Zombies on their graphic t-shirts, and see all kinds of Zombie jewelry. So if you've got a tween or teen and they want to through a Zombie party- and it's not even Halloween, don't worry. I'd say just try to have some fun with it. These signs are great on the front door. I might even put one one the door or stairs to the attic or basement. See who's brave enough to go down their with just a flashlight. So you see there really is a Zombie for everyone. If you've got a Mom or Aunt who just loves to garden, then give them Zombie gnome for their own special Halloween decoration. I think it's the small touches like this that really make Halloween decorations special. You can take this Zombie garden gnome and put him in your front yard rose garden. It shows you have an eye for details! Put this Zombie Hunting Permit bumper sticker on your car and park it in the driveway to greet your guests. See how many people actually noticed it. I love adding these small details to my Halloween decorations. My guests have come to expect it - and they keep their eyes open to find them all. I think the zombie in the toilet is a terrible thing to do to your guests!!! Shame on whoever invented it!! I love it. Creepy, crawley Halloween spider webs and decor will send shivers down your spine. Welcome Halloween visitors with a dark and foreboding wreath stuffed with bats and black cats, witches, ghosts and ghouls.